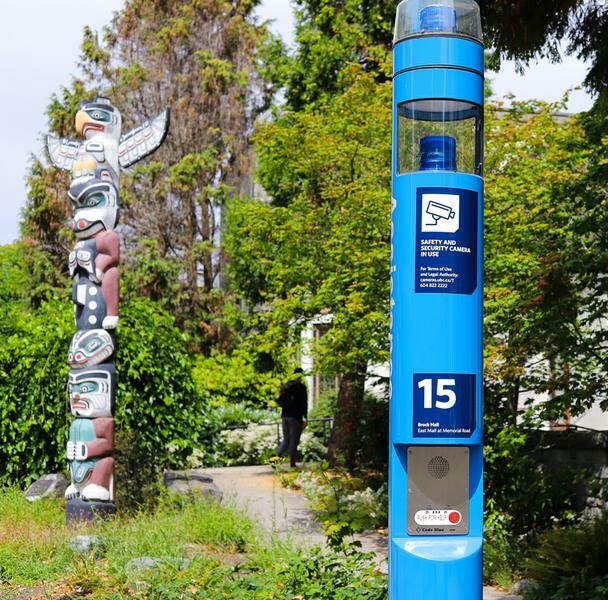 In 2014, UBC installed 19 “blue phones” on campus to improve security and emergency assistance. Today, 71 phones are strategically placed across campus, each directly connected to Campus Security’s phone line. But even as the number of phones has grown, the number of calls made with them has sharply dropped, and the nature of the calls has shifted from security to general assistance. The phones themselves are hard to miss — they are tall poles with a bright blue light and can easily be seen from afar. In 2016, 21 new phones were installed, followed by an additional 31 by the start of 2017. The number of blue phones present on campus currently stands at 71 — nearly four times as many as those first installed back in 2014. Rob McCloy, executive director of Campus Security and Safety, attributed the incorporation of blue phones into the campus security network as a response to instances of security concerns back in 2013. He also acknowledged that the primary function of blue phones is no longer solely security. Over the years, there has been a shift in the nature of calls made from the phones. In 2014, over 90 per cent of all calls made were “unfounded,” meaning that when officers were sent to the site, no one was there. In 2017, only 35 per cent of calls were unfounded. McCloy attributed the more efficient usage of these phones in part to more awareness amongst students about the purpose the blue phones serve on campus. Despite being used for more deliberate reasons now, the blue phones are hardly used. In 2017, there were fewer calls made from blue phones than the total number of phones on campus. This means that some phones go through the year without ever being used. There may not be such a thing as an abundance of safety precautions for a university, but this still brings up important questions when adding in the cost factor for the blue phones. In 2016, the cost of adding the new blue phones and updating older ones was $1.32 million. In 2017, maintenance costs for the phones were $5,100. McCloy does not place too much importance on the indications of these statistics himself. Overall, McCloy emphasized the value he sees in the blue phones’ presence on campus, be it for security purposes or even for providing non-emergency assistance to campus.